A juvenile delinquent gets out of the pen and causes reckless mayhem, mostly directed at the girlfriend of the journalist who helped send him up. The first time around, I was a little lost on this one. I didn't have the proper knowledge of its historical context. The Criterion liner notes are a big help. I just wish I had read them more recently. This is a satire of the militaristic attitude that eventually lead Japan into WWII. I remembered it being a comedy. It does have its comic moments, mostly involving Kiroku's uncontrollable erections, but it is rather serious in tone. Well, that's even a little weird. Suzuki is able to create a remarkable balance between the film's serious themes, its action sequences, as well as its comic touches. All the while, he creates a film of outstanding imagery, gorgeous cinematography, and artful editing. To think, Suzuki Seijun had probably no ability to choose which films he made. He was a bit lucky to land this one, though, as it was written by Kaneto Shindo, who had to be hot stuff after having already directed both The Island and Onibaba (though I wouldn't know how those films were received in Japan). 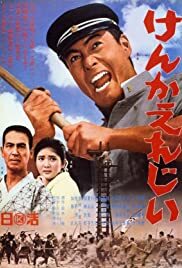 This is one of only two Suzuki films that stand outside of the yakuza genre, so here (and in Story of a Prostitute) he was able to deal with deeper themes than normal. But anyway, Suzuki had little control over what material he was to direct, one way or another. I find his ability to create great art infinitely more impressive than any number of cinematic artists who had more or less complete control over their own work. It would be utterly wrong not to include Suzuki in the pantheon of the world's greatest film artists.